I have walked the north bank of the River Tyne between Newcastle and North Shields (13-18) and the south bank between Gateshead and South Shields (01-12), more often than not in shorter lengths. The past fifty years have seen drastic changes brought about by industrial decline and regeneration. 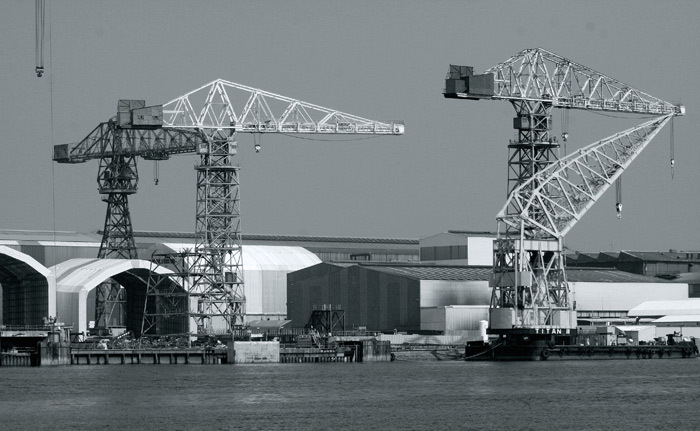 Here, the two cranes surviving from the many serving Armstrong Whitworth's High Walker Naval Yard now loads ships. 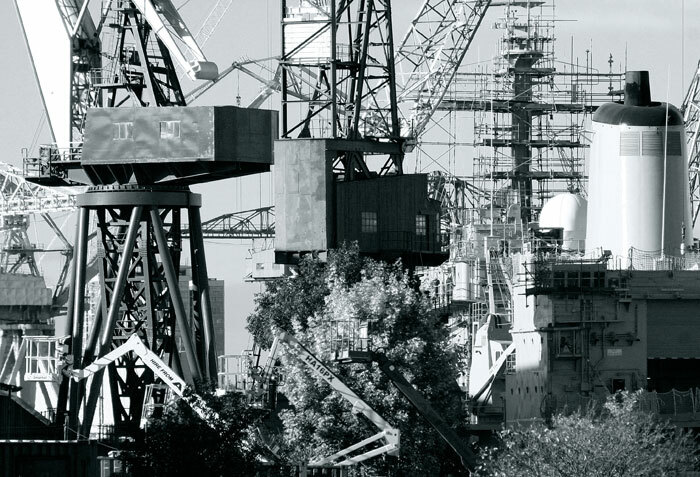 Shipbuilding ended in the 1980s. The lower lengths of the Yard's slipways are said to be visible at low tide but my visits have, by chance, never coincided. One of its most famous vessels was the battleship 'HMS King George V' launched in 1939. The KGV was part of the Royal Navy fleet that destroyed the German battleship 'Bismark' in the North Atlantic in 1941. These two images were made standing close to the remains of the much smaller Harrison's Ship Repair Yard at Bill Quay that closed in 1990. The huge cable drums are backed by the manufacturing building and the slender steel framework of a large gasometer sited on higher ground beyond. A south bank riverside park has been established between Bill Quay and Hebburn and virtually all traces of earlier industry have gone. BBC Rosario was completed in 2007, quite new when photographed and sailing under the Cyprus flag. 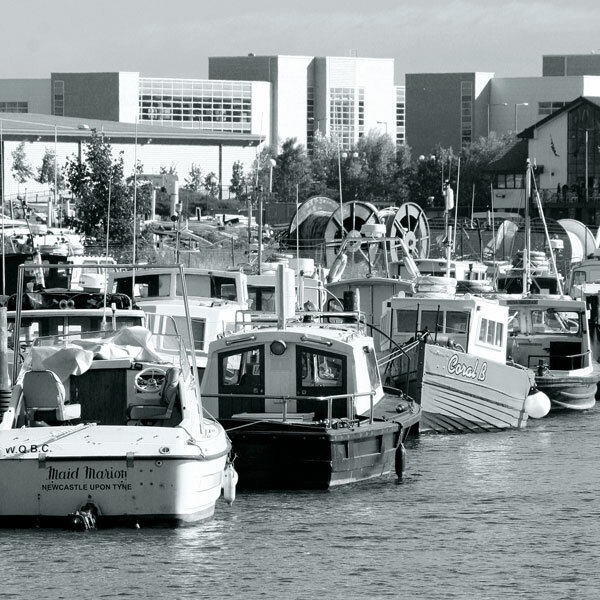 Shipyards once lined both banks of the river from west of Newcastle city centre to the sea. Upriver, the vast W.G. Armstrong engineering and armaments works at Elswick built state of the art warships for the Royal Navy and foreign navies up to the end of the First World War. 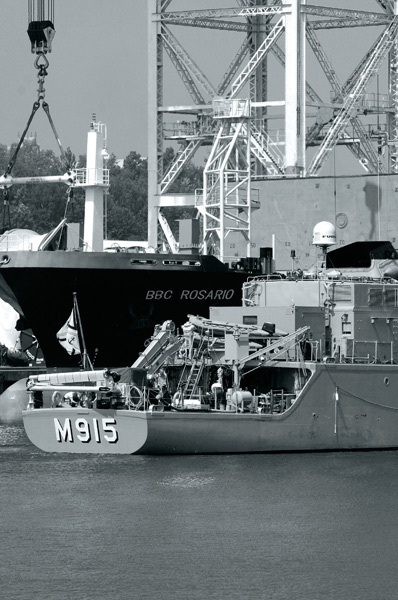 'Aster', the Belgian Navy's minehunter M915 was a reminder of past river activity. Once, cargo vessels docked at the quays in central Newcastle and further upriver. For a few days in 2005 the Tall Ships Race fleet moored there, creating a fleeting glimpse of the sights and sounds of that earlier era. Photographs from the event appear in the two Tall Ships galleries. A little further downriver this house stood in gentle decay. I have not been back for some time (2011) and would not be surprised if it has been tidied away. 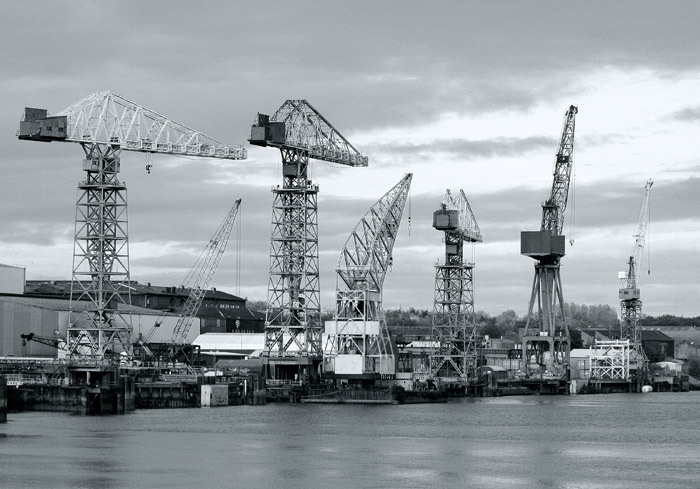 Established in 1860, the Swan Hunter shipyard must be one of the best known in the country. The Cunard liner 'Mauretani' of 1906 was fitted with the then revolutionary steam turbines developed nearby by Charles Parsons. These were much smoother and more powerful than contemporary reciprocating steam engines. 'Mauretania' gained the North Atlantic Blue Riband on her maiden voyage in 1907 and held it for twenty-two years. 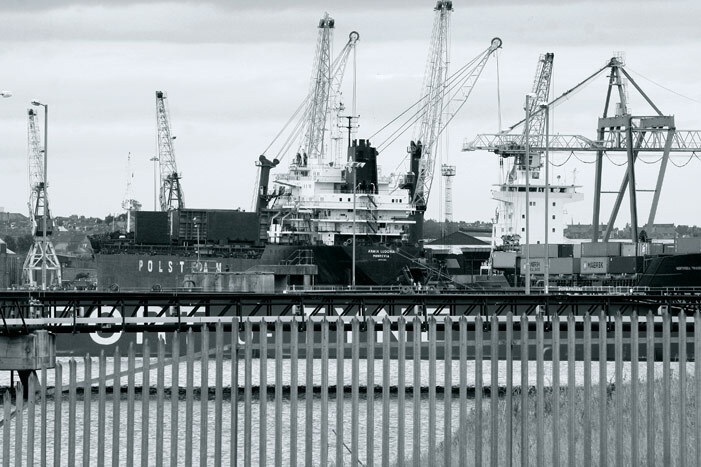 During the period I photographed this set I also recorded the final demise and destruction of the Swan Hunter Shipyard. 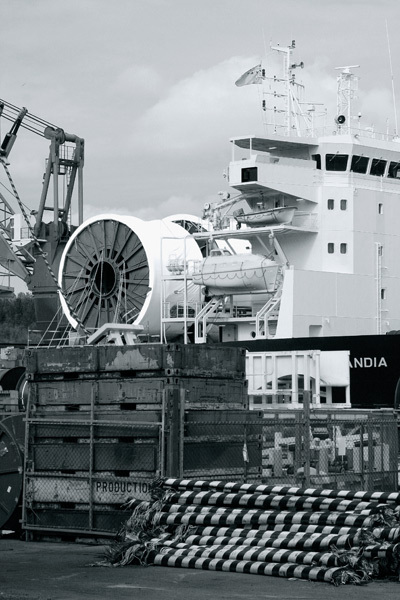 In 2007 many of its heavy engineering plant, cranes and the floating dry dock were bought by Bharati Shipyards and transported to India. 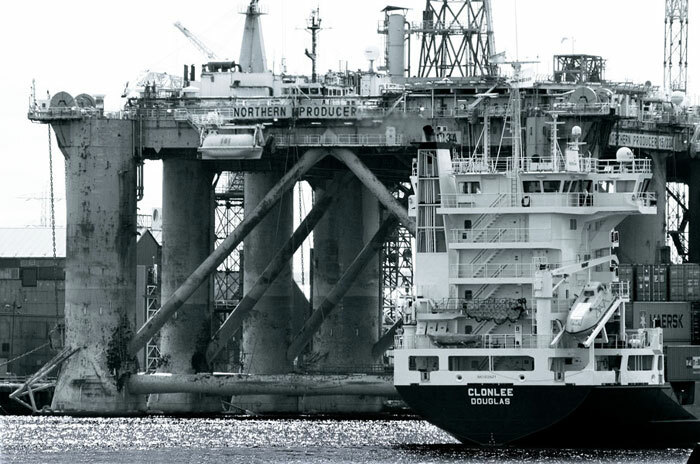 In 2011 the yard is engaged in the decommissioning of North Sea gas and oil industry platforms. In 2007 the 'Bigorange XVIII' briefly occupied a drydock in the eastern half of what was once (I think) the R & W Hawthorn Leslie Shipyard, now owned by A & P Tyne. 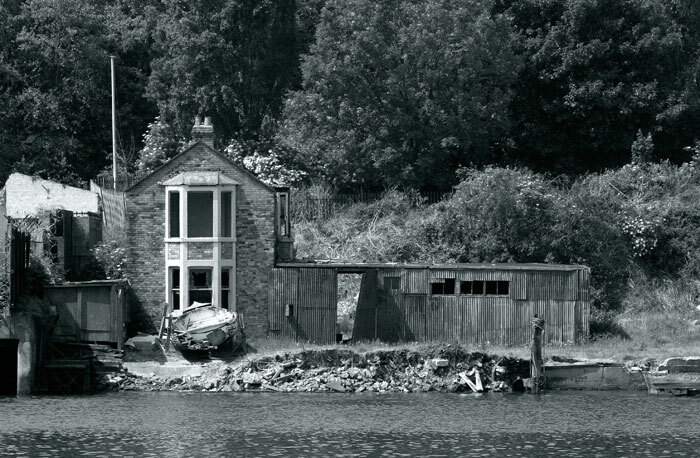 The decaying remains of the former company's office and building sheds still stand nearby: some enterprising photographers have worked inside them and posted images online. This view is from the eastern boundary of the yard and shows the RFA 'Fort Austin' undergoing an extensive overhaul and modernisation in 2007. Glimpses of cranes in the Swan Hunter yard across the river provide a backdrop and the whole is a reminder of a once common sight and way of life along both banks of the river. 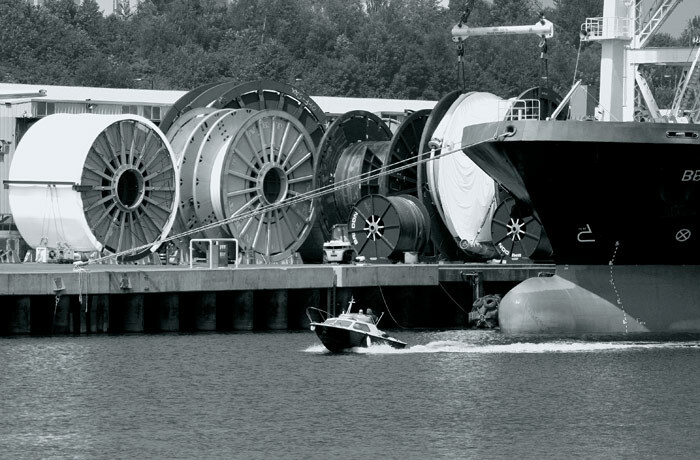 These tugs were moored against a jetty just downstream of the A & Tyne yard. Cleared industrial sites gave access to walkers and rugged scrambling tracks for young motorbike riders. It's now closed off by high steel railings that now block access to almost all such areas on both banks of the river. Port of Tyne is the principal commercial dock. A footpath alongside the River Don leads to a small vantage point at its entry to the River Tyne. Close by is the Monastery at Jarrow established in 682AD and linked to its 674AD counterpart at Monkwearmouth in Sunderland. Both were home to the contemporary theologian and historian, the Venerable Bede. The pedestrian ferry linking North and South Shields is the sole survivor of many that once operated across the river. At the northern landing it's a short walk to the Fish Quay from where one can see the North Sea between the twin Tyne piers. 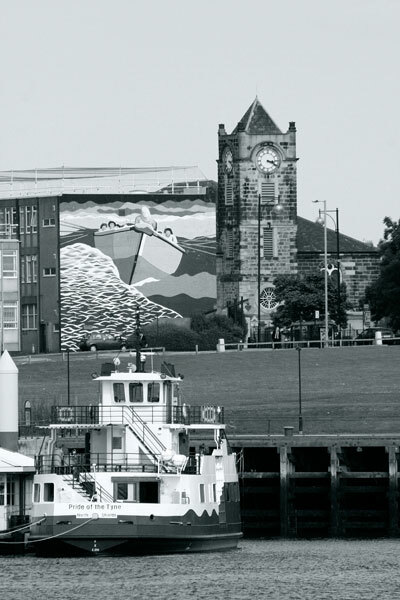 This 1981 mural by David Wilkinson depicts the South Shields lifeboat 'Tyne' that served for sixty years from 1833. The boat itself is displayed elsewhere in the town. Local boatbuilder Henry Greathead completed the 'Original' of 1789 as the world's first purpose-built lifeboat. A contemporary fellow townsman, William Wouldhave, is credited with the first design for a self-righting boat. 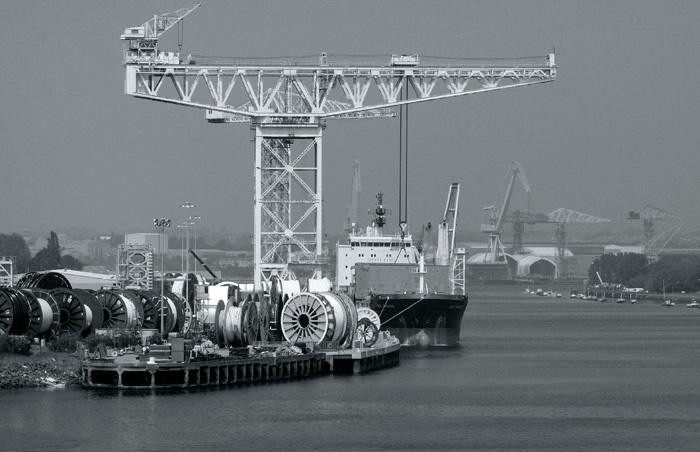 McNulty Offshore Construction provides wide ranging engineering design and construction skills to the offshore oil and gas industry. 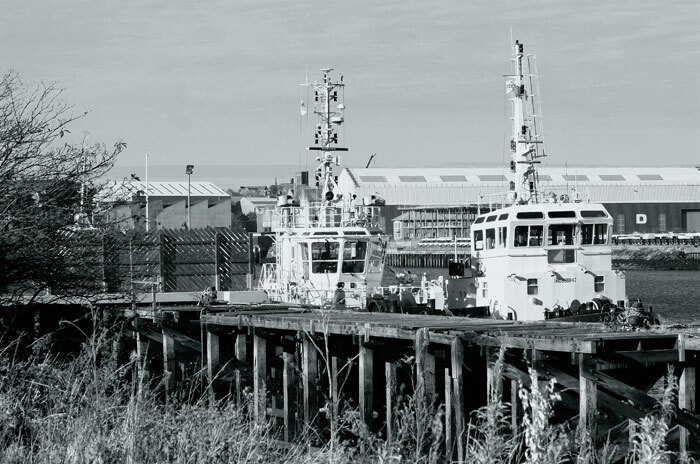 Their yard is across the Tyne from the North Sea Ferry terminal at the Tyne Commission Quay. The 'Clonlee' is a cargo vessel operated by North Atlantic Shipping, here carrying containers to an upriver destination quay. On the north bank, this small river flows through Willington Dene and into the River Tyne. Once heavily industrialised, some dereliction has been cleared for new industry and to create urban parkland. 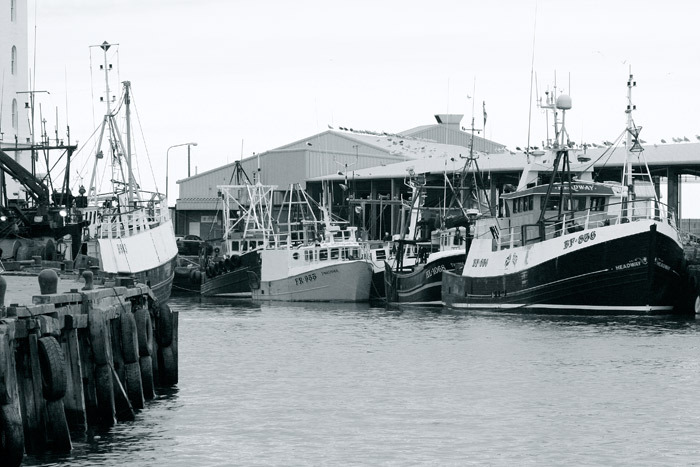 I took this photograph with my back to a boatyard that stores, repairs and builds small boats. Some remains of much larger and now defunct shipyards lie alongside. 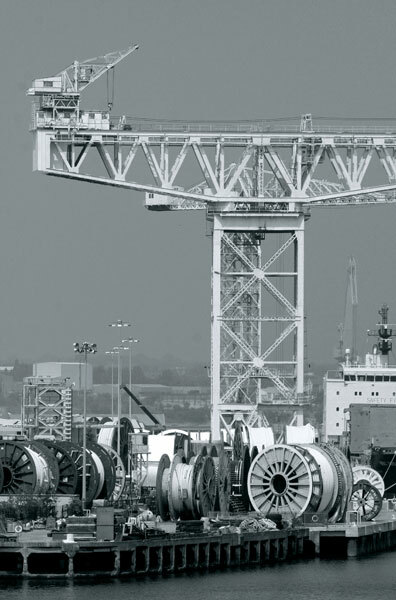 The A & P Tyne shipyard in Hebburn lies across the river from the once world-leading Swan Hunter yard at Wallsend. The latter closed in recent years, its machinery, cranes and a floating dry dock shipped to India. 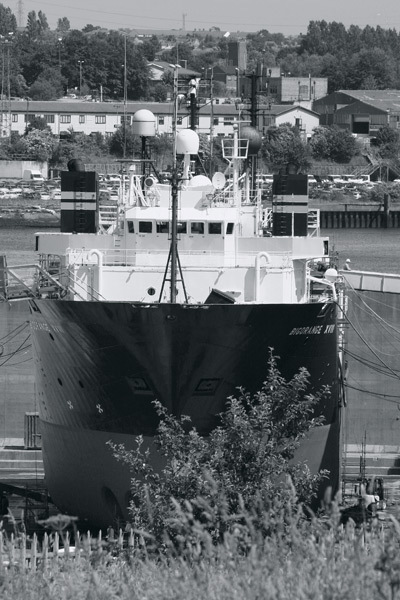 Here, 'Normand Seven' is in the final stages of a refit: another gallery is devoted to its departure from the River Tyne in 2007. 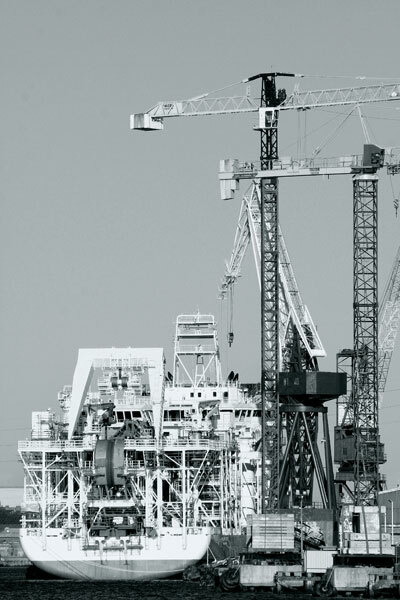 This is a detail from the off-shore technology work occupying the site of the former Walker Naval yard illustrated in the first set of images in the gallery. 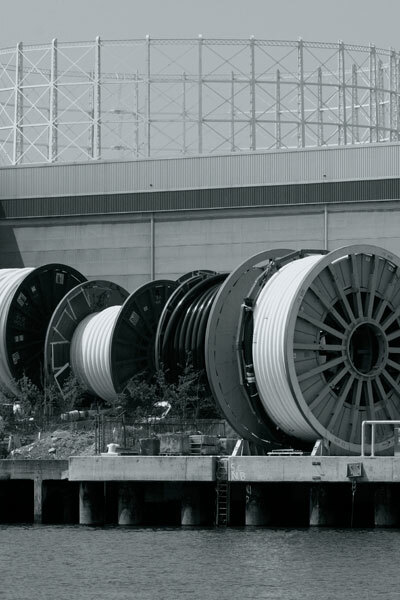 Chopped lengths of undersea cable lie in the foreground. A colour abstract from the severed ends features in 08 of the Abstract Images 2 gallery.